Organising a successful conference is a question of priorities, from excellent presentations to getting the details right. Conferences aren’t only about the talks, though. For a lot of attendees, networking is more important than attending talks, especially if the videos are going to be online. 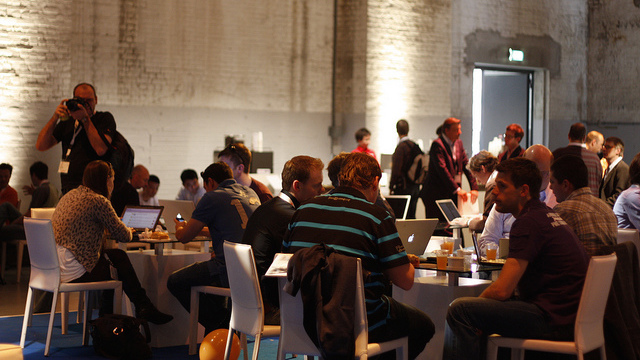 For people on remote teams, or in remote locations, conferences are giant meet-ups. This article provides tips to help conference organisers improve networking at their event. Networking overlaps with entertainment, not because going on a conference is just a jolly (in which case you’re doing it wrong), but because the entertainment is usually social and provides the best networking opportunities. Provide drinks at the end of the day so attendees can get together and plan their evenings before they leave the venue. Designate an official conference pub so attendees can meet up for the second eight hours of each day. For bonus points, negotiate a discount or special area for conference attendees. From a networking perspective, the whole point is that lots of people from all over the world are in the same place at the same time. This makes the physical space set-up vitally important, because having the right people in the same building but not in the same room could be a tragic near-miss. Put exhibitor stands and social area seating in the same room, so that hanging out and talking includes everyone. Provide a quiet/work room for people who need to finish a presentation or get some work done during the conference, or who just need to recharge their energy for socialising. Make the speakers’ ‘room’ a roped-off VIP area in the main hall to encourage speakers to mix more with attendees, assuming that there’s a quiet work area somewhere else. Make attendees queue for some limited resource because the queue for the fancy coffee made by the hipster barista can be a good place meeting people randomly. Twitter is a great tool for integrating online communication with meeting in real life, because of how it supports low-barrier connections with a large group of people for a short period. Put the conference hashtag everywhere to make it easy for attendees to discover people who are talking about the conference, and what they are saying. Publish a Twitter list for all of the speakers to make it easy to read their tweets as a group, without having to find and follow them individually. For bonus points, make a list for all attendees, so anyone can tap into the firehose of what people at the conference are talking about, without having to rely on hashtags. The rise of the unconference and Open Space Technology give conference organisers ways to let attendees to do more than passively listen to talks. Active participation is great for getting to know new people, and various conferences have added one or more of the following the the schedule. Informal unstructured evening sessions around specific topics - sometimes called Birds of a Feather (BoF) sessions. These are good for people who didn’t want to miss any sessions during the day but still want to get into discussions and is, I suppose, an alternative to going straight to the pub. Bonus unconference day after the end of the conference, to give attendees a way to continue discussions generated by things they heard during the main conference. Unconference track during the conference for attendees who want to make their own agenda, during the conference.